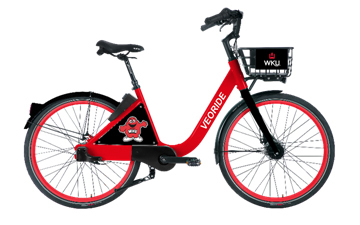 VeoRide has officially inked a deal to be the exclusive provider of a micro-mobility fleet of bikes to WKU. Micro-mobility includes all modes of short-distance transportation, including standard pedal bikes, e-assisted bikes and e-scooters. Provided at no cost to the University, the agreement initially calls for 180 seven-speed bikes featuring the WKU logo and colors, with the addition of e-assist bikes to the fleet in the future. VeoRide is an easy-to-use and adaptable dockless micro-mobility share company that allows customers to locate a nearby bike via their smart phone and unlock the joy of bike riding for a quick commute or simply a ride to enjoy the outdoors. VeoRide was started by two Purdue University alumni who began launching the micro-mobility share service in 2018. VeoRide currently operates more than 15 programs nationwide in Arkansas, Illinois, Indiana, Iowa, Kansas, Massachusetts, New Hampshire and Texas, and continues to expand to additional markets each month. “Survey results indicate that WKU students are very interested in this service,” said Brad Wheeler, AVP of Business Services. “We are excited to announce the VeoRide team as our exclusive provider of branded, app-enabled bikes. To rent a bike, simply download the VeoRide app and locate a bike. Then, open Bluetooth on your phone, scan the QR code on the bike or enter the bike’s ID to unlock it, and ride. At the end of your ride, park at one of several designated parking locations identified in the app and simply push the button on the bike lock to end the trip. Current pay-as-you-go bike rental rates start at 50 cents for 15 minutes. Day passes are $6.99 and include unlimited two-hour rides. Additional packages are available at a discount to students, faculty and staff for $13.99/month or $48.99/annually and include unlimited one-hour rides. Standard rates are $28.99/month or $99.99/annually. Although an official launch date hasn’t been determined, the bikes are expected to be available on the WKU campus this fall. For more information about VeoRide and stay informed of the official launch date and activities, follow VeoRide on Facebook or go to www.veoride.com. To learn about job opportunities with VeoRide on the WKU campus, visit our Careers page. About VeoRide: VeoRide, with offices in West Lafayette, Ind., and Chicago, Ill., is an easy-to-use and adaptable dockless micro-mobility share company. Micro-mobility includes all modes of short-distance transportation, including bikes, e-assisted bikes and e-scooters. We aim to provide multi-modal alternative transportation to cities and college campuses. VeoRide currently operates more than 15 dockless micro-mobility share programs nationwide in Arkansas, Illinois, Indiana, Iowa, Kansas, Massachusetts, New Hampshire and Texas, and continues to expand in additional markets each month. For more information about the company, visit www.veoride.com.